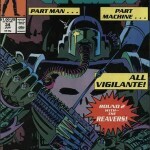 As many long-time readers of this blog know, I am a fan of comic books. I’m particularly drawn to more realistic characters like the Question, Batman and especially the Punisher. I appreciate the fact that it’s just a small leap of faith to imagine a world where these guys really exist. That gritty realism also increases the dramatic tension since, ultimately, the hero is mortal. Unlike Superman, Thor or Wonder Woman, the stakes are higher because, if not for the hero’s skills, he’d be dead. Recently, I bought a little piece of comic book blogosphere history when I purchased the first 68 issues of the Punisher ongoing monthly series from Chris Sims of the Invincible Super-Blog, War Rocket Ajax and Comics Alliance fame. 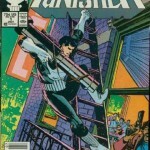 These magazines – the entirety of Mike Baron’s run as writer on the title – were part of Chris’ infamous Box of Punishment when he read every book and comic starring Frank Castle he could get his hands on. Now, I haven’t made my way through all these just yet, but something is striking about them. Namely, these covers are fantastically bad. 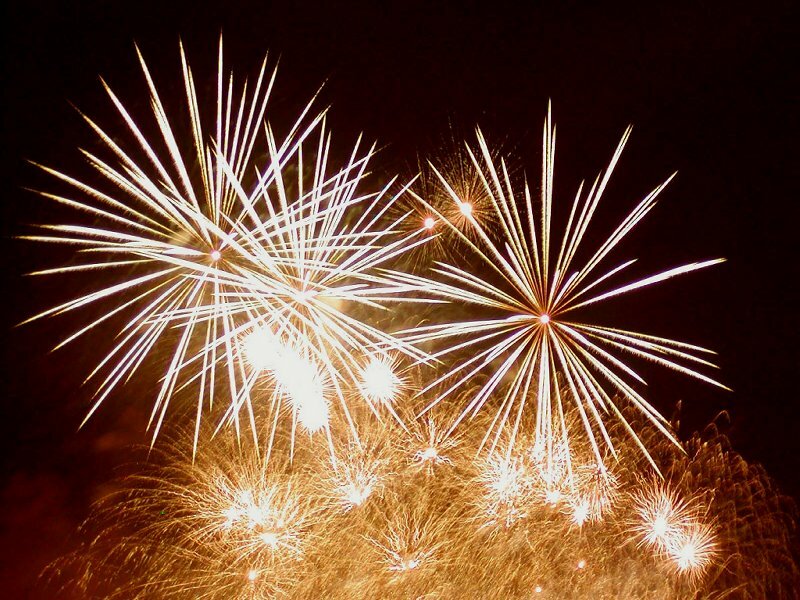 They’re not just unrealistic – diminishing the book’s charm – they’re laughably over the top. 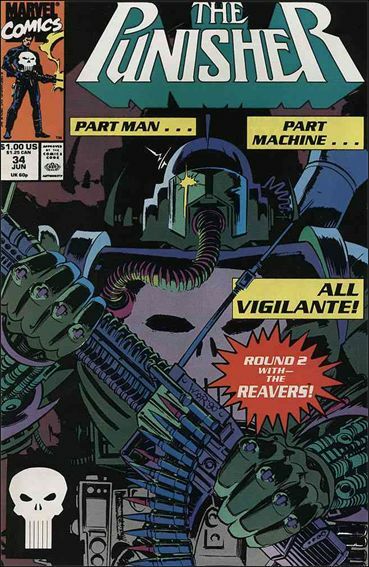 The Punisher #1 – A classic cover that grabs the readers’ attention as the Punisher breaks up a drug deal by levelling a bazooka at a criminal…. at point blank range. 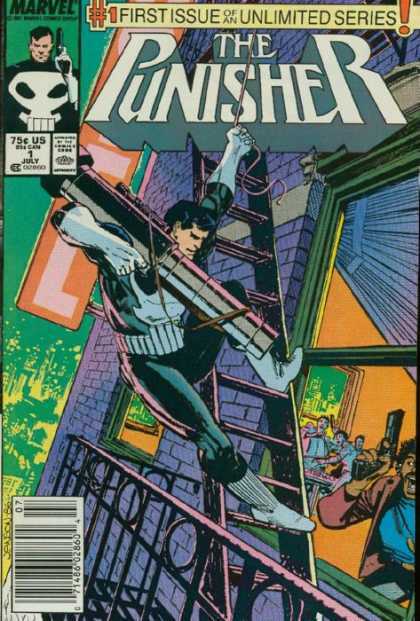 Never mind that missile launchers are probably too heavy to hold with just one arm, the real concern is that when Frank Castle pulls the trigger on that bad boy the kick will send him flying off his precarious perch on the fire escape. Should the Punisher somehow manage to hold on, he’ll undoubtedly be killed by the explosion and ensuing shrapnel from the incinerated corpse of his victim and the building itself. This is the tactical genius that strikes fear in the hearts of the Marvel Universe’s criminal brotherhood? Also, please note his all white boots and gloves, ideal for sneaking around in the dark alleys of New York City. 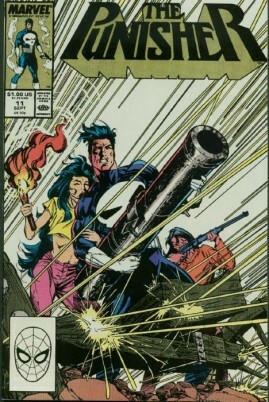 The Punisher #11 - For the next 10 issues the Punisher’s covers were limited to pretty standard fare. Indiscriminantly shooting off rounds at unseen targets… Cavalierly tossing grenades at the reader… You know, reasonable stuff. But then comes issue #11 (“Second Sight”) where our hero travels to Mexico to exercise his vengeance on human smugglers who left their cargo to die of dehydration in the desert wastelands of west Texas. After drinking some mescal and going on a vision quest of sorts, Frank and the local brujo dispatch the people traffickers with a variety of weapons including a pitchfork and an antique cannon, apparently from the time of the Conquistadores. 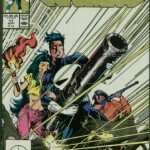 You can see the cannon right there on the cover: the Punisher has ripped it off its moorings with his bare hands and is apparently going to fire it from his hip like an automatic rifle. Again, it’s a physically impossible feat. The cannon, presumably made of cast iron, would easily weight a thousand pounds. When one of these cannons fires it rolls several feet and has to be pushed back into position by an entire crew of gunners. So, allowing that Frank was able to hold it up long enough for it to fire, he and his Mexican lady-friend would be sent flying by the recoil. 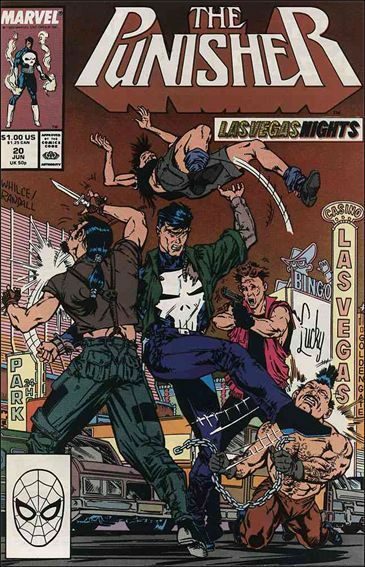 The Punisher #34 – After two years of reasonably sane covers, including growing a beard to infiltrate a gang of bikers, attacking a correspondence school for ninjas and flipping some punks in Las Vegas (for real) the Punisher had to tangle with his toughest foes yet – the Reavers, the mutant-hunting cyborgs who had (briefly) killed the X-Men. Their first battle didn’t go so well for Frank, resulting in him apparently becoming a cyborg himself. I particularly appreciate the fact that by the next issue he’s all better again. Because being turned into a cyborg is totally reversible. Just takes a quick overnight surgery and you’ll be flesh and blood again. Also, for reasons beyond my understanding, all cyborgs and robots in the late 1980s and 1990s were depicted as being a deep green or purple. I really don’t remember metals turning that colour… ever… even in the Neon Nineties. 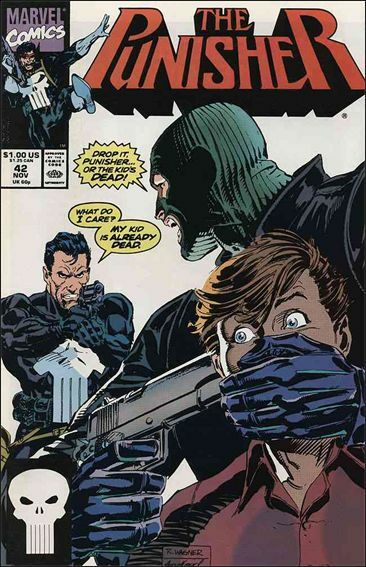 The Punisher #42 – Somewhere around issue #35 the editors at Marvel Comics decided to add some dark humour to the Punisher, edging the books toward self-parody or even camp. For example, puns and pop-culture references were littered throughout the six-part Jigsaw Puzzle storyline the preceded this issue. 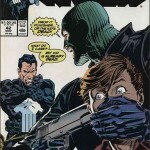 When the title returned to one-and-done stories the Punisher’s covers used that dark humour to try and grab the reader’s attention. There’s so much to enjoy here: the Punisher’s shockingly unconcerned approach to the safety of innocent victims of violent crime, the hostage’s panicked expression as they realize they’re totally screwed, the background completely devoid of any scenery. It’s all a rich tapestry. 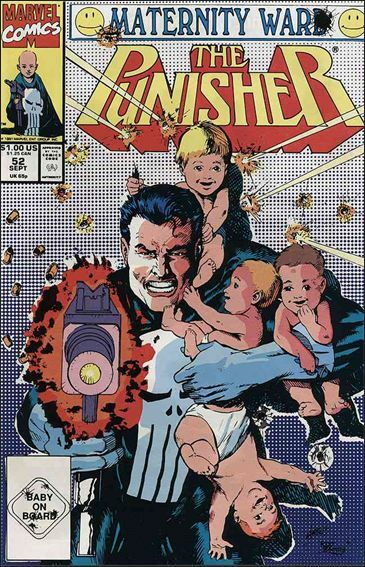 But what I like best is that it’s firmly established in the Punisher canon that Frank Castle had two children. Apparently, in the heat of the moment he’s realized that he really only ever loved one of them. 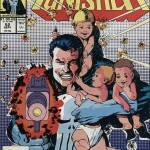 The Punisher #52 – Skipping over a few covers that see Castle strapped to the muzzle of a giant gun, standing on the roof of a cab before shooting the passenger and fighting neo-Nazis, we leave on a high note: “Maternity Ward”. Excuse me, “Maternity War”. You see, a bullet hole has obscured the “d”. Yes, the Punisher has gotten into a gunfight in the midst of a hospital’s maternity ward and he’s either trying to rescue four babies from the marauding baddies or maybe add on to his body armour. I truly admire the editor’s dedication to the cover’s theme, from the wan smiley faces on either side of the issue’s title, to the bullet-riddled “Baby on Board” sign in the postmark box. Even the publisher’s logo has a small child draped in the Punisher’s uniform and brandishing an Uzi. Such an impressive eye for detail! It’s amazing how damn goofy these covers are, especially since this is supposed to be one of the most realistic characters in comics history. Another one of my video game reviews went on the Canadian Press wire today. This time was slightly different though. 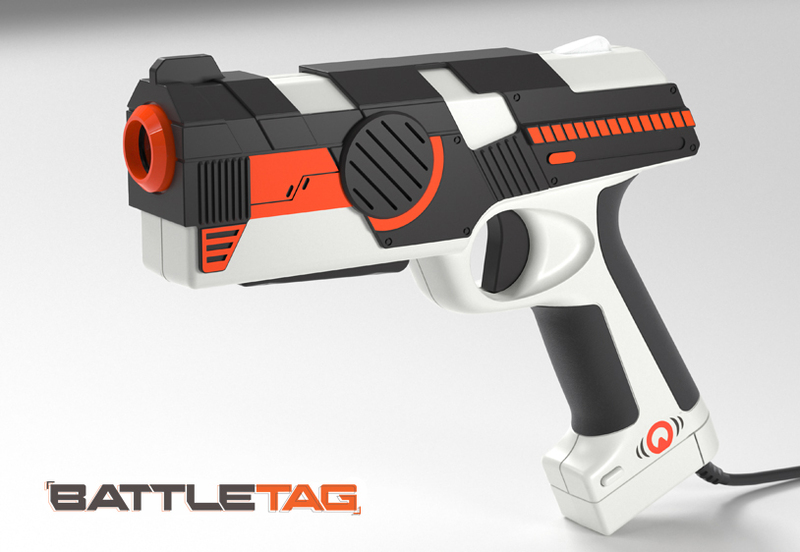 Although the game was produced by Ubisoft, a well-know video game developer, "Battle Tag" is a toy, albeit one that plugs in to your home computer. I had a blast lot of fun writing this piece. How could I not? After all, I got to play laser tag with my fiancee and got paid for it. Anyway, follow the link below to read the whole thing for yourself. "Motion capture technology in video games has been a theme this holiday season. Platforms like the XBox and PlayStation 3 have put out new peripherals with motion sensitive controllers or cameras, forcing gamers to get up off the couch and get physically active.